I had the wonderful opportunity of partnering with Liberated Wine to share my small story and what it means to live “intentionally small.” The following post was originally featured on Liberated Wine and I am so happy to share it here on my blog. Enjoy! By now we’ve all heard something about the “small living movement” – whether it be about tiny homes on trailers, prefab micro-units in bustling cities, or baby boomers downsizing to enjoy their retirement. My personal interest comes from a different perspective, one that is ever-changing and redefined with each chapter of life. My name is Nicole Alvarez. I’m an architectural designer living and working in downtown Raleigh, North Carolina. I’m on the brink of turning 30 years old. 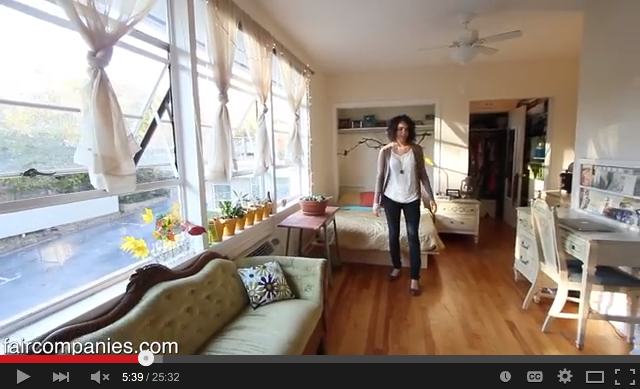 At 25 I started my blog Intentionally Small about small spaces and simple living. It was the perfect culmination of my studies, interests, and life experiences. I studied architecture in college. While in school, one of my favorite projects was the design of a backyard apartment. It was the first time that I thought about how a small space and a person’s lifestyle and routines could influence each other. A year later I studied abroad in the South of France. I shared a small apartment, featured in this mini-documentary, in the heart of the city and walked everywhere. It was a surge of independence that I had never experienced, having grown up in a car-dependent American suburb. It was my experience living in a 300-sqft studio apartment a mile from downtown Raleigh that motivated me to start my blog. It was the first place of my own, and exactly what I needed at the time. I was immediately captivated by the big windows, built-in storage, and the subtle differentiation of uses, live/sleep/eat, all bundled into one intimate space. Everything intentional, and everything within reach. It was the first time that I could walk to a coffee shop, a few bars, a yoga studio, even my job. I felt connected to my community in a way I never had before. I quickly realized that what I loved most about living in a small space was the way of living that inevitably followed. Less space meant less physical and mental clutter, and therefore more time to enjoy life. The time came to leave my lovely studio apartment when my boyfriend and I found an apartment to call our own. Our priority was walkability and bikeability, wanting to be as close to downtown as possible since that’s where we worked and played. We found the perfect place, a loft in an adaptive reuse of an old department store on the main street of downtown Raleigh. 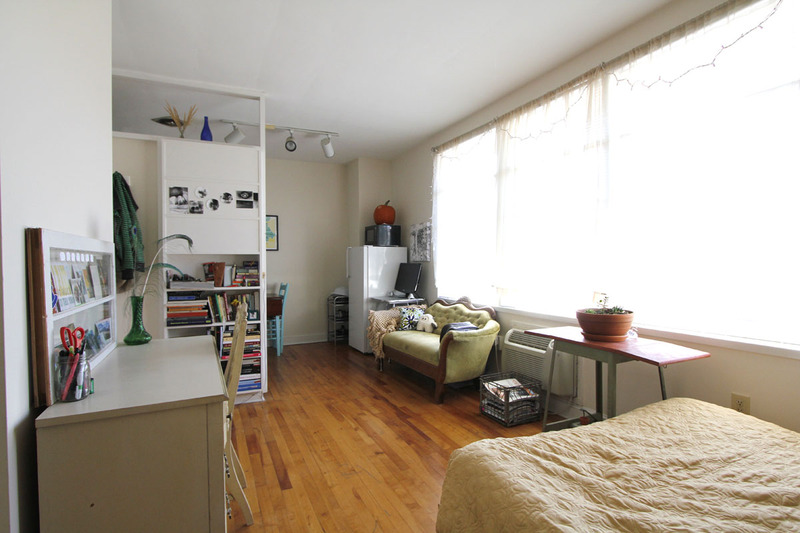 At 960 sqft , 1 bed and 1 bath, it was the smallest unit in the building, but at the time felt huge to us. The living space opened up directly onto a terrace, extending our space to the outside. Our memories are of entertaining our friends and family, having the city at our fingertips, and creating our first home together. We were able to live the vibrant lifestyle we had both admired from our time overseas right here in our hometown. We got engaged, got married, and bought our first home, just blocks away from downtown. Our home is 1,170 sqft, only slightly larger than our downtown loft but a world of difference – 3 bed and 2 bath, filled with daylight from every side, and a large yard. We were able to maintain the urban lifestyle we loved, and made an investment in our future while growing firm roots in our community. It’s a small home, but it’s plenty for us at our current life stage, with room to grow. We have future plans of building a backyard apartment that we can either live in or rent to offset our mortgage. We’ve been living here for a year, and are taking our time making it home, along with our new family member, our pup Mayhem. Small is relative. It changes with the context of each city and its density. It is so personal, redefined with each stage of the individual’s life. Yet, every small story I have heard has a common thread – it is about living intentionally. For me, living small and an urban lifestyle go hand in hand. By choosing place over space, the city becomes my home, the community my family, and there’s so much more room to enjoy life. A liberated and full life. Interested in attending a free architecture lecture in Raleigh this weekend? Find out more details about the event and reserve your free seat here. Hope to see you tomorrow morning! The time has come for Apartment Therapy‘s annual Small Cool Contest! Are you interested in submitting your small space for this year’s contest? This weekend is your last chance! Submissions are due by May 20 at 6pm EST. Visit the contest page for more info. 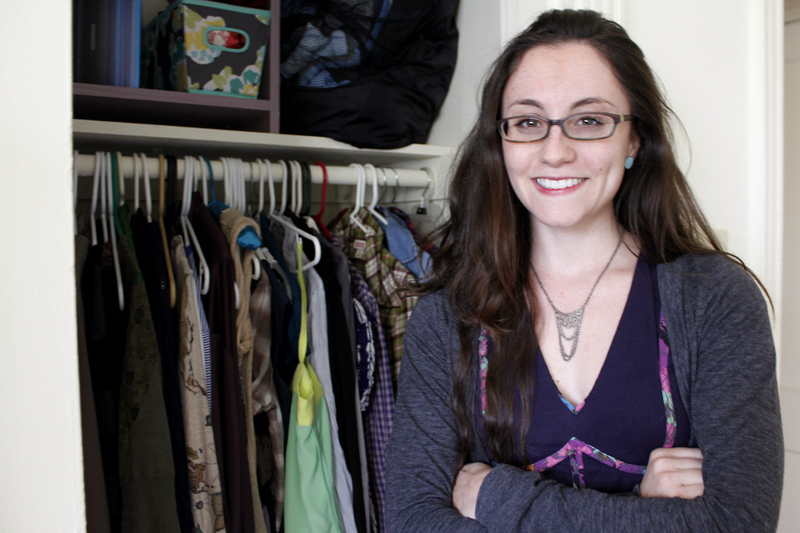 Clothes are a big part of our lives, and can be a big part of our budgets. In an attempt to simplify your life and save money long-term, could you commit to only “shopping your closet” for a year? Marie is my most fashion-savvy friend. 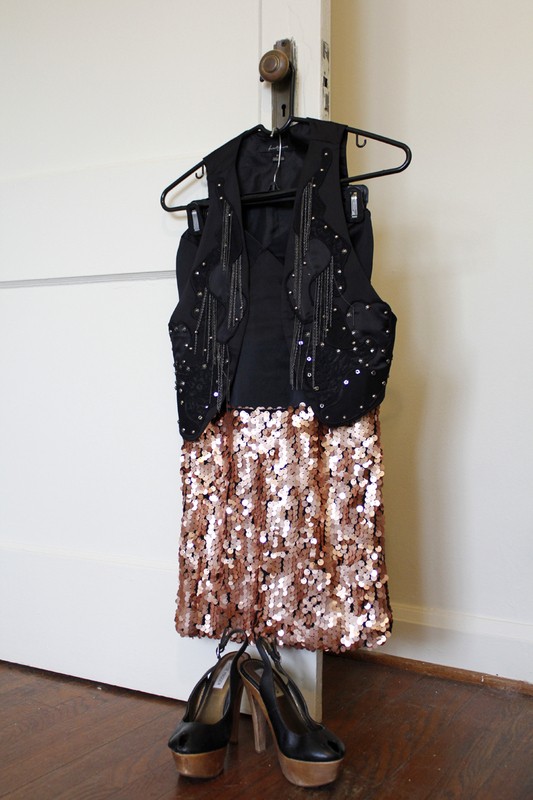 She’s never been afraid to spend big bucks on a fabulous wardrobe must-have. So when she told me she was not going to buy clothes for the year of 2012, I was a bit skeptical. Now, a year later, I can vouch that she did it! Well, mostly. Why did you decide to go a year without buying clothes? There were several reasons, but I primarily wanted to save money. I read about the idea in Real Simple magazine; a couple listed a year-long moratorium on clothes shopping as the best money-saving decision they had made. I added up the amount of money I had spent the previous year on clothes, and it was over $2,000! At that point, I was determined to make a change, and use that money for something more fun than hanging another sweater in my closet. I had also recently moved to a very small town in the mountains (see her small home) without a mall or boutique in sight, so temptation to shop was at an all-time low. The rules were simple: don’t buy any clothes, either new or used, for one calendar year. I started on January 1, 2012. I did make an exception for costumes. Halloween is very important to me! How did you fare on your challenge? Did you keep your word? I did pretty well, but I wasn’t perfect. I made it all the way until August, when I purchased an outfit (see below) to wear to Penland School of Craft‘s annual benefit auction- a soiree so fabulous I felt it warranted the purchase of a new dress and shoes. And, I effectively ended my challenge on December 30, 2012, with a modest shopping spree. I know, I know, I was weak and couldn’t wait two more days! What was the first thing you bought after the completion of the challenge? 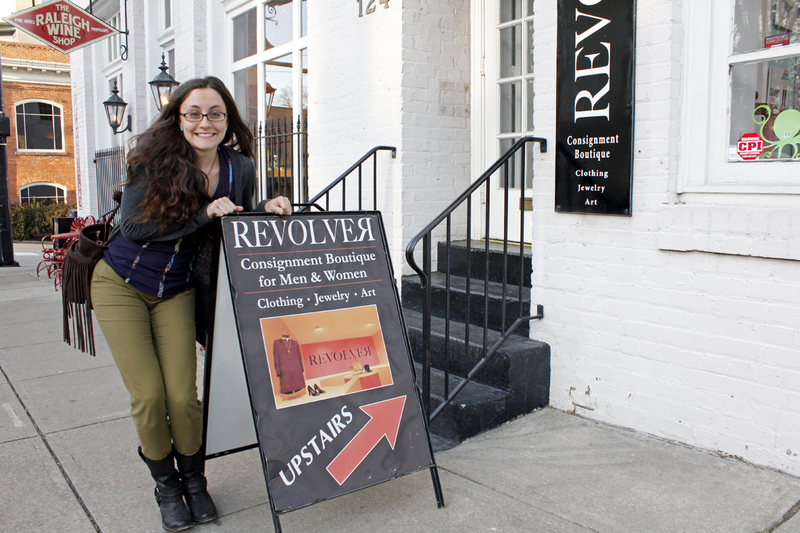 I bought some great pieces from Revolver Consignment Boutique in Raleigh- my all-time favorite store. Two sweaters and a silk blouse. How has this year of not purchasing new clothes changed your habits/lifestyle? What did you learn? This year taught me that not buying clothes is a lot easier than I ever imagined. When you make the choice to “shop your closet” instead, you’ll be amazed at what you find in there! Also, after making the conscious decision not to shop for clothes, I began to make similar decisions with respect to other stuff, too. For instance, I stopped buying home goods, jewelry, and gift items as well. When I walked into a store, I thought: “Look at all this stuff I don’t need,” rather than “Look at all this stuff I want!” It has been incredibly liberating, and I hope I can stick with this new outlook as I settle back into life in the Big City of Raleigh, NC. This year, I’m challenging myself to add something to my life instead of eliminating. I’d like to spend the year nurturing relationships with the people who are dear to me. Removing excess from my life a little bit at a time, starting with bad shopping habits, has cast a sharp light on what is most important. Auditi: Small but spacious, with more light than you can image. Adam: Our house is located in East Raleigh. When I started looking for a house, I said I had to live within a 1 mile radius of the state capitol. I fell in love with the 827 location and got to know the neighbors. No other locations I looked at had a comparable proximity to downtown. Auditi: The master bathroom shower, all the sunlight, and the downstairs heart-pine floors. Adam: Open, compact, reused materials, natural light, pushing limits of space and materials, simple space with complex process. Auditi: I’d love to include a proper mud room, i.e a space where we can dump our jackets and muddy shoes before we enter the house. Adam: We need to work on finish furnishings (couches, chairs, etc. ), and organization. Auditi: It keeps Adam and I from accumulating unnecessary stuff. Everything in the house is exactly and only what we need. We don’t believe in uni-taskers (besides the fire extinguisher and our currently used toothbrushes), so everything in the house must have a dual purpose. Adam: Awareness of “stuff” (and limiting it). Small living doesn’t mean you can’t entertain. There is a lower cost of living (build price, tax, energy). Less to think about (decorating, etc.). Auditi: No uni-taskers allowed, besides a fire extinguisher, and ok, perhaps a toilet bowl cleaner. Everything should have dual-function. Adam: Thank you to Nicole for being involved in the process! Also, we bought all our kitchen appliances from Craigslist or through auctions. We have a solar hot water. The upstairs floor is a finished plywood subfloor. I admire the idea of making a home that you can grow into with your future family. It may not be “small” if you are strictly looking at square footage, but considering the lifecycle of the house and the future growth of your family, it is appropriate and responsible. This is what Adam and Auditi had in mind when they approached the architects about designing an affordable, modern home in East Raleigh. The Chasen Residence was one of the first projects I saw develop from concept through construction at in situ studio. The house is compact, yet spacious. On the ground floor, the entrances, kitchen, 1/2 bath, closets, and stair are aligned to one side of the house, opening up the rest of the space for living and dining, from the front porch to the screen porch. A double-story living space at the front of the house fills the spaces with light from all sides, including the ceiling. A lofted office space looks down to the living space and out to the street. This loft can actually be converted into a third bedroom when the family grows, while the future closet space makes a perfect desk nook in the meantime. The master bedroom is humble in size and closet space, yet has wonderful views outside, including the Raleigh skyline. Adam and Auditi bring a special character to their home: their bikes hang from the screen porch ceiling, the flexible living space accommodates small and large dinner parties enjoying their baking/cooking talents, and an extensive, large salt water fish tank separates the den from the rest of the living space. They have collaborated in making a custom home to suit their lifestyle. Thinking further about “aging-in-place,” they hope to build an accessory dwelling unit, or garage apartment, to rent and/or expand their living. We were able to get creative with low-cost, special details. I especially love the reclaimed doors on tracks to hide closets and a bathroom. Read more about the house and see more pictures through in situ studio: the Chasen Residence. This website is a continuously evolving project, and online resource for the Raleigh Community. If you would like to learn more about this topic, follow the conversation, or contribute to this public resource, please contact me. The next Comprehensive Planning Committee Meeting, today at 2pm in Council Chambers, will continue the discussion of Backyard Cottages. An undergraduate architecture project initially sparked my interest in ADUs in Raleigh, and small spaces in general. 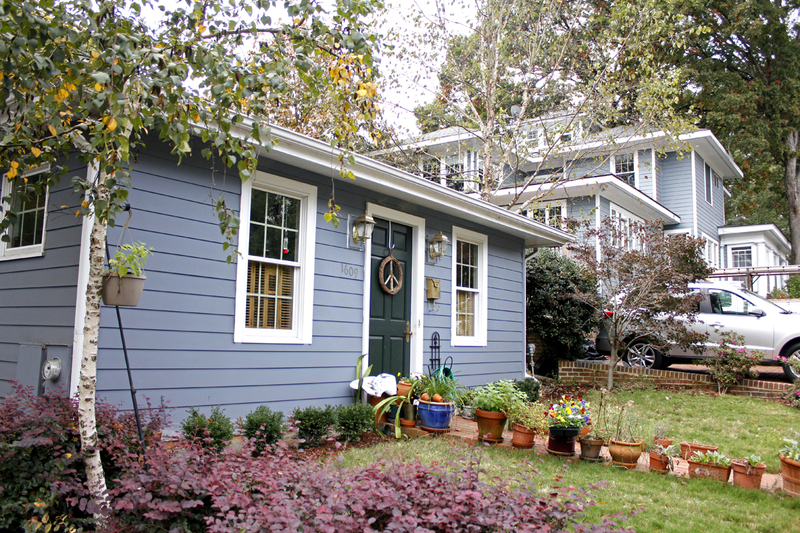 Within the historic neighborhoods of Raleigh, in backyards and along the inner alleys, there are many old carriage structures or garages that have been converted into apartments. 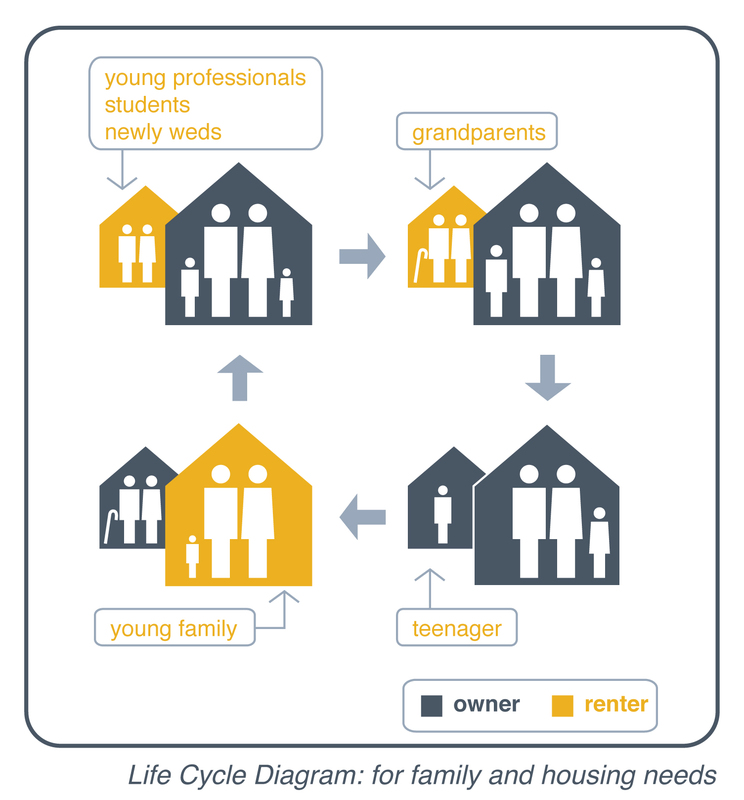 I fell in love with their intimate scale, efficiency, and sustainable life and housing cycle (see diagram above). These original structures were grandfathered-in, but construction of new ADUs has not been permitted since the 80’s. I researched the subject further years later through my thesis, which led me to start Raleigh Accessory Dwellings to record and share my research. Since changing a city’s code and zoning regulations is a long and arduous process, I saw my online-resource as a way to engage the Raleigh Community in the meantime. I was not expecting Raleigh’s proposal of legalizing Backyard Cottages to become such a heated subject. Now I am an active member in the conversation of allowing BYCs in Raleigh. I spoke in support of Backyard Cottages (BYCs) at the last Comprehensive Planning Committee meeting. It was interesting to hear the different perspectives during the public comments, from both supporters and protestors. The issue is still not resolved, and the Committee will be researching more topics to see if and how BYCs will be allowed in Raleigh. See a video of the meeting: visit City of Raleigh RTN, click “Other Government Meetings,” and find the video on November 14, 2012. I will be at today’s meeting, and I will continue to contribute to Raleigh Accessory Dwellings. If you are interested in becoming part of the conversation, please contact me. Kirsten Dirksen of faircompanies creates videos as a means of exploring her interests in gardening, DIY, sustainable lifestyles, and small living. She stumbled upon the world of Tiny Houses, which opened the doors to a world of people choosing to live small. In her documentary, We The Tiny House People, Kirsten introduces us to the small spaces of “People searching for simplicity, self-sufficiency, minimalism and happiness.” These spaces range from Tiny Homes on trailers in Sonoma Country, California, to a cave dwelling in the Pays de la Loire region of France (my favorite! ); and from simple spaces made of reused materials, to kinetic spaces with custom furniture. What’s best, you learn what it’s like to live in each of these spaces as the residents share stories of the creation of their home, and how their lives have adapted to the spaces. This weekend, in the midst of running errands and enjoying the company of your family/friends, I encourage you to take a break and curl up on a couch to watch this documentary. Conversations about small living quarters have “made it big” in the headlines the last few months. It’s been both exciting and overwhelming – exciting that new people are exposed to this idea and overwhelming to try to keep up with everything that’s going on! An Accessory Dwelling Unit, or ADU, is an independent, secondary residence to a single-family house – either attached or detached. There are many names for ADUs: granny flats, backyard apartments, in-law suites, carriage houses, backyard cottages, garage apartments, etc. Pictured above is one of my favorite ADUs in Raleigh. As an Architecture school project, I designed a backyard apartment, which exposed me to the alley networks of Raleigh’s historic neighborhoods and their many converted carriage structures. This is when my interest in small spaces began. ADUs provide flexibility in living arrangements and a source of income for the owner, an affordable housing option near the city center for the renter, and more diversity and density for the neighborhood and greater community. In Raleigh, construction of new ADUs is prohibited, but this subject is currently under review in the new Unified Development Ordinance. Plenty more on this subject in posts to come. Similar to ADU’s, Laneway Houses, or Alley Dwellings, are small residences in the back yards of single-family houses, but they are on their own lot. This usually involves an exhaustive zoning and permitting process of subdividing an existing lot, to create two independent lots, with the smaller lot usually accessible from an alley. A dwelling with its own address can then be constructed new, or existing infrastructure can be rehabilitated. Pictured above is a proposal by in situ studio (where I work) and David Hill AIA for the HOME Competition. Our design of small, affordable dwellings builds on the idea of Laneway Houses. We leveraged the current zoning changes in Raleigh which will reduce the minimum size of a lot, and created a new zoning district, RA-50, made of the trimmed off excess land at the back of the lots. This would create an alleyway neighborhood in the centers of residential blocks. Learn more here. Toronto is one of the leading cities of Laneway Houses, focusing on developing their inner residential blocks. The Laneway House designed by Toronto architecture firm Shim-Sutcliffe is truly inspiring. I am equally intrigued by the alley structures that became homes at out necessity and accessibility, like Browns Court in Washington DC. There is a growing number of people that have completely embraced small living, to an extremely small scale. Most commonly these are literally “tiny houses,” with gable roof and porch, scaled down in size to fit on a trailer for easy transportation. 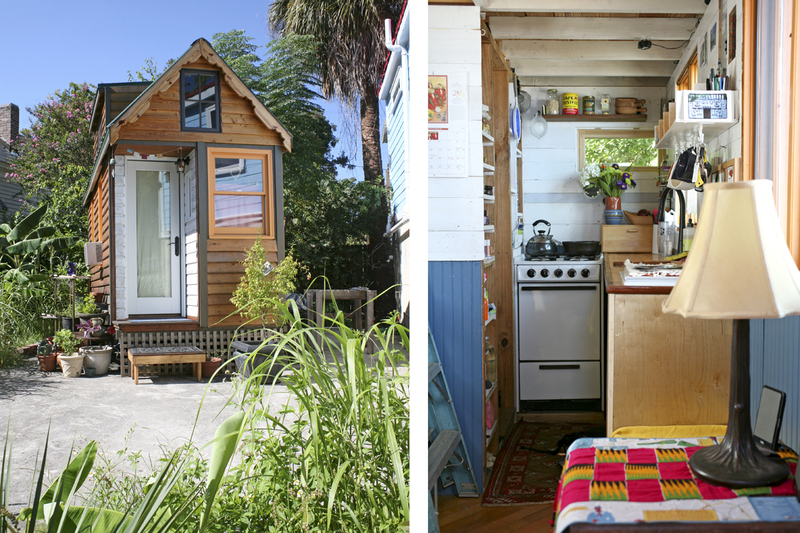 Pictured above is La Casita, the cherished home of Andrea and Cedric of Charleston Tiny House. Thanks to Andrea for the pictures. Keep an eye out for a post about La Casita coming soon. Jay Shafer of Tumbleweed Tiny House Company has led the Tiny House movement by selling plans and organizing workshops that empower people to build their own Tiny House while joining a community of supporters. Some US cities like San Francisco, New York City, and Chicago, are revisiting the minimum size for apartments as a way of increasing housing options for singles and couples. The proposal of micro-unit apartment buildings in San Francisco as small as 220 sqft has stirred up both support and protest. Pictured above is a rendering of SmartSpace, championed by Patrick Kennedy. 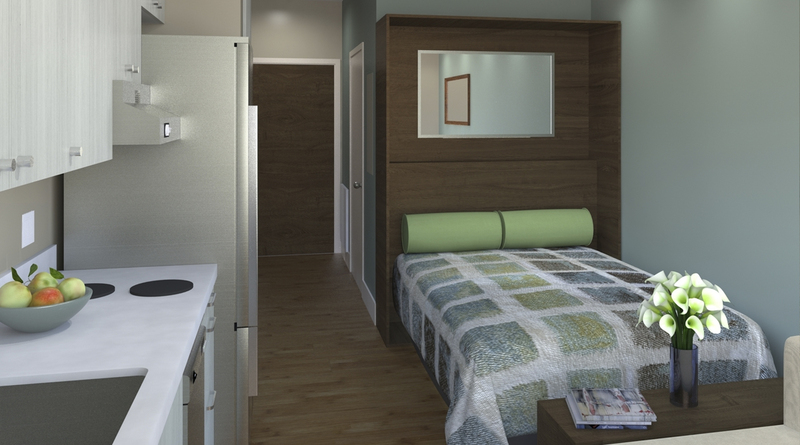 NYC’s Mayor Bloomberg launched adAPT NYC, a call for designs of micro-unit apartment buildings. Sarah Susanka, architect and author, has been writing since 1998 about the “Not So Big House” – a residence that favors quality over quantity by reducing square footage. She was at the forefront of this modern perspective of small living, which has spawned a movement where Americans are reconsidering the size of their homes. 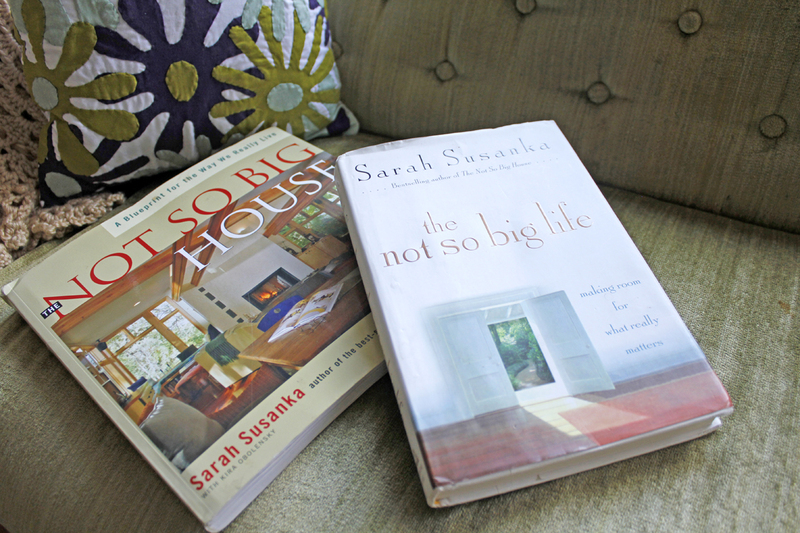 I have come across Sarah’s collection of books more recently, and am really enjoying reading them while relating to my own experience of living in a small apartment. I’m currently reading The Not So Big House: A Blueprint for the Way We Live and The Not So Big Life: Making Room for What Really Matters, pictured above on my not-so-big sofa with a not-so-big pillow. An edited lifestyle comes hand-in-hand with living in a small space. When you don’t have much space to store unused items, you begin to cut down on physical (and mental) clutter, and become more conscious of what you actually need to live. I realized a greater appreciation for a simpler life grew naturally out of living in my small space (pictured above). This is what interests me most about architecture – how a space can inspire your life. An effective way to make the most of a small space is to have furniture that can easily collapse to store away, or transform to serve another function. A simple example is a futon: bed to couch. Others are much more complex, specifically designed for the space and its inhabitants. These “kinetic spaces” feature integrated furniture that can move and change, and suddenly your bedroom has turned into your living room. These are fascinating! Commonly, kinetic spaces emerge out of necessity, so it’s no surprise they can be easily found in densely-populated, Asian and European cities. Know of other successful examples of kinetic spaces? Please share! This blog will help me document my exploration of small spaces – experimenting with my own apartment and examining others.